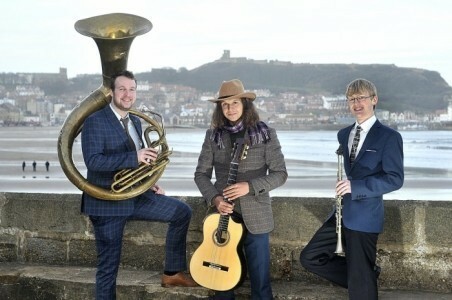 The Jelly Roll Jazz Band are a lively and dynamic traditional jazz trio, originally based in the North East of England but now working regularly across the country. The Jelly Roll Jazz Band are a lively and dynamic traditional jazz band, originally based in the North East of England but now working regularly across the country. They have a diverse repertoire, ranging from New Orleans standards like ‘Bourbon Street Parade’ through to Disney classics such as ‘The Bare Necessities’, via some less conventional tunes – anyone fancy a jazz version of ‘My Heart Will Go On’? 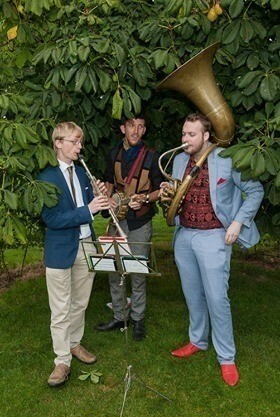 Whatever the occasion, the band are certain to bring smiles to faces and help the event go with a swing. They usually play as a trio or quartet, and can easily adapt th ... eir instrumentation depending on a client’s needs and the availability of the musicians. Furthermore, they are able to play completely acoustically, making them ideal for outdoor events. They perform regularly at everything from wedding receptions to birthday parties to exhibition openings. Recent engagements have included playing for the Tour de Yorkshire, Malton Harvest Food Festival and the ‘Monday Menu with Music’ at Scarborough Spa Complex. 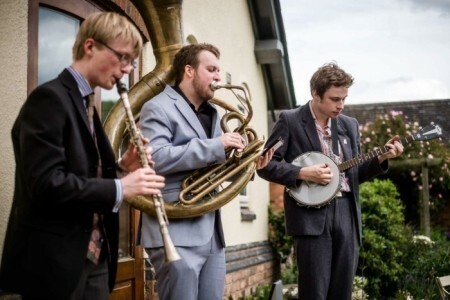 Since those early days the band has developed considerably, and today it usually takes the form of a trio, with clarinet, banjo (or guitar) and double bass (or sousaphone). The band draws its musicians from a pool of around seven regular members depending on who is available, and this fluidity creates a constant stream of fresh inspiration and ideas. One of the band’s greatest strengths is its flexibility. Much of the music is improvised around a core melody and chord progression, and therefore it is very easy to change or add instruments depending on the occasion and which players are free. The musicians all originate from Scarborough, and the band still performs regularly in this area. However many of the members now live further afield, and they are available for bookings across the country. Recent performances have taken them as far afield as London, Darlington and Warwick. The style of music they play is traditional (‘Dixieland’) jazz, and they have a repertoire of around 100 songs so are able to play for hours without repeating themselves. Furthermore, they are capable of playing for hours without repeating themselves. They cover a range of standards from the 1900s to the 1930s, including such favourites as ‘Down By the Riverside’, ‘When the Saints’ and ‘The Sheik of Araby’. Their repertoire also features more recent hits like ‘The Bare Necessities’ and ‘Moon River’, and they have even branched out into ‘90s pop with versions of ‘My Heart Will Go On’ and ‘…Baby One More Time’. Always keen to broaden their horizons, the band have recently begun writing original material, and they are currently working on a trad. jazz version of Stravinsky’s ‘The Rite of Spring’. Their influences include jazz greats such as Benny Goodman, Louis Armstrong, Fats Waller, Jelly Roll Morton and Chris Barber. The eccentric humour of The Bonzo Dog Doo-Dah Band plays a big part in their performance style as well, often lending a slightly surreal edge to proceedings. 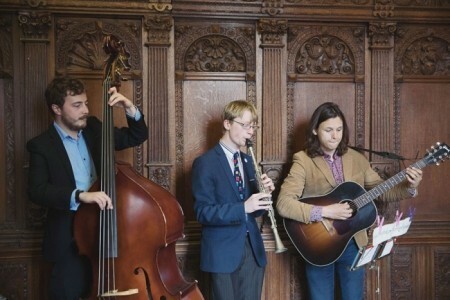 They are available for concert performances as well, where their lively style and natural rapport with an audience ensures a highly entertaining evening for all involved. In concert, they are able to include rather more props and bits of audience participation, such as ‘The Incredible Shrinking Clarinet’, ‘The Dice of Set List Determination’ and ‘The Onions of Self-Awareness’. To get an idea of how the band comes across in this setting, have a listen to their album ‘Indoors At Last’, which was recorded live in concert. The band is very compact, and can easily squeeze into the corner of a room if space is limited. 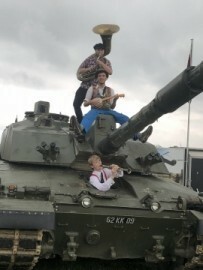 In the past this has allowed them to perform in tight spaces such as the area at the front of an open-top bus, and even someone’s living room! Furthermore, they are capable of playing for hours without repeating themselves. They usually perform completely acoustically, and therefore do not need a power supply of any sort. This makes them ideal for outdoor occasions, and events that involve a lot of moving around. If amplification is required, however, they can include that at no additional cost. Another feature of the band is their ability to walk around whilst playing, depending on the combination of instruments (it’s much easier to do with a sousaphone than a double bass!). This is especially useful for outdoor events such as fayres and rallies, and can lend a really dynamic feel whilst enabling the musicians to cover a much wider area. Michael and The Jelly Roll Jazz band were fantastic for our DIY country wedding. They played two fabulous sets which really added to the atmosphere of the day. They were professional, prompt and completely hassle free – just what was required. They are a really talented group and we have had so many positive comments from guests about how great they were! Thoroughly recommended- and excellent value for money. Truly memorable. The wonderful Jellyroll Jazz Band played at my husband's 60th birthday party which took place in our garden on a fabulous Saturday afternoon. We set them up under the gazebo and they absolutely made the day. My husband was unaware there was going to be a band until the three young men appeared. We loved the diversity of the music they played; I bought one of their cds afterwards which has been heard many times since in our garden. They played for 3 hours with 2 breaks and were well worth their fee. 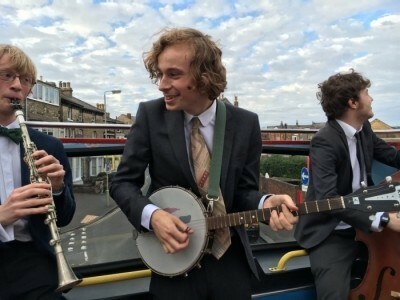 They are very gifted musicians, as well as being lovely young men, who made the party go with a swing and I would definitely book them for our next event as long as they play the Star Wars song for me again! The Jelly Roll Jazz Band were perfect! As part of a gatsby themed birthday party, they were the life and soul with an exquisite repertoire. Very attentive and punctual from the first contact. The enormous applause at the end said it all. Highly recommend. The Band played at the reception for our daughter's wedding in the unusual setting of Boggle Hole Youth Hostel - well done for making it down the hill! They were perfect for the occasion, with a great choice of lively and well-known tunes, and never dominated the proceedings by being too loud. They are all extremely talented musicians. The vast majority of the wedding party are singers and performers, so are hard to impress, but everyone enjoyed the music and commented on the lovely atmosphere the band created. Very highly recommended to help your event go with a swing! Thank you.